We love sushi. When I asked my husband what we should eat to celebrate his birthday, he mentioned sushi. Today, he thought we should take a trip to Uwajimaya so we could enjoy sushi at home. Music to my ears! I’ve been wanting to make sushi and re-check my sushi recipes for weeks now anyways, and had been fighting off intermittent sumono salad cravings for some time. Off to Uwajimaya we went. Salmon, tuna, and octupus, as well as sumono salad and miso soup. Tempura shrimp found their way into the basket, but we were kicking ourselves for not thinking about tempura veggies. One day we’ll get around to experimenting with kale tempura…mmm…likely they’ll be the crispiest, nuttiest kale chips ever. 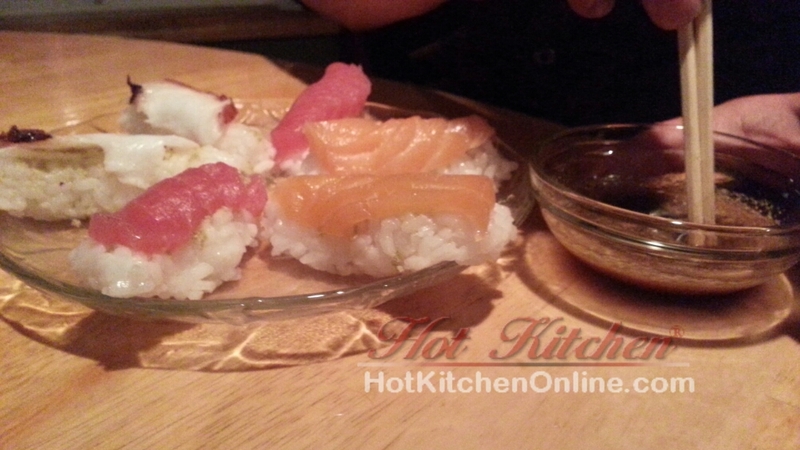 I broke out the recipes from the sushi episode and we whipped up the rice, sweet-salty dressing for the rice and sumono. We totally nailed the sumono salad, but the miso soup was dreadful (see pic). 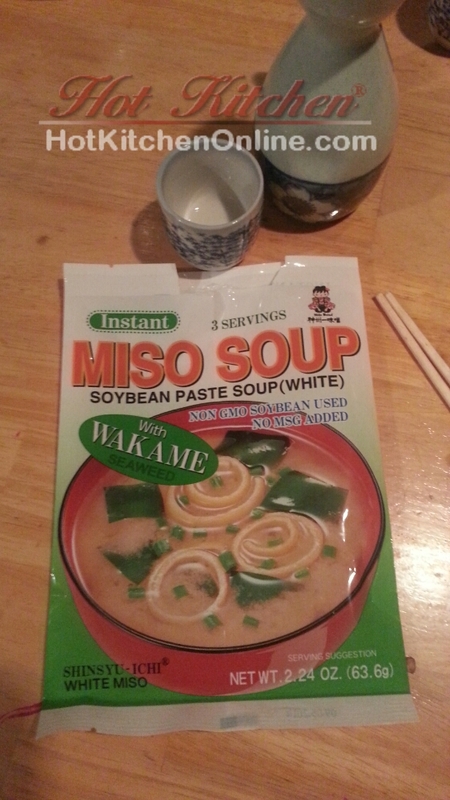 At least next time we’ll know not to buy Miko Brand miso soup . Seriously friends, it tasted as thought it had languished inside a dead fish before getting packed and shipped to the US. 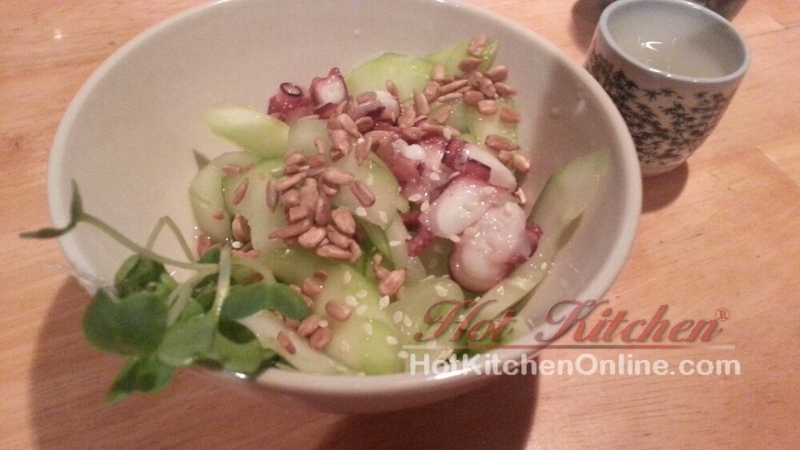 The sumono salad was spot on and made me regret limiting us to just two cucumbers. Double dressing is totally the secret to getting the cucumbers to a slightly pickled state, while keeping the dressing bright and crisp. Sumono salad, with sunflower seeds and radish sprouts. My recipe makes for perfectly wilted cucumbers. Simple and perfect, our nori salmon, tuna, and octopus hit the spot! 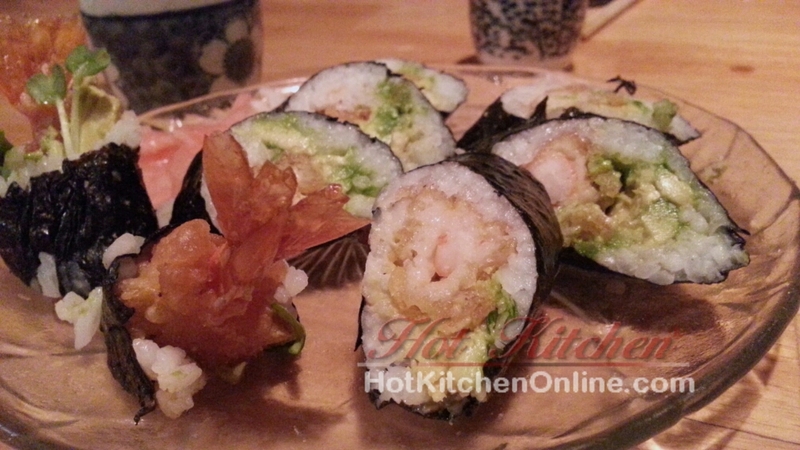 One of the rolls we made, tempura shrimp and avocado, cut on the bias. 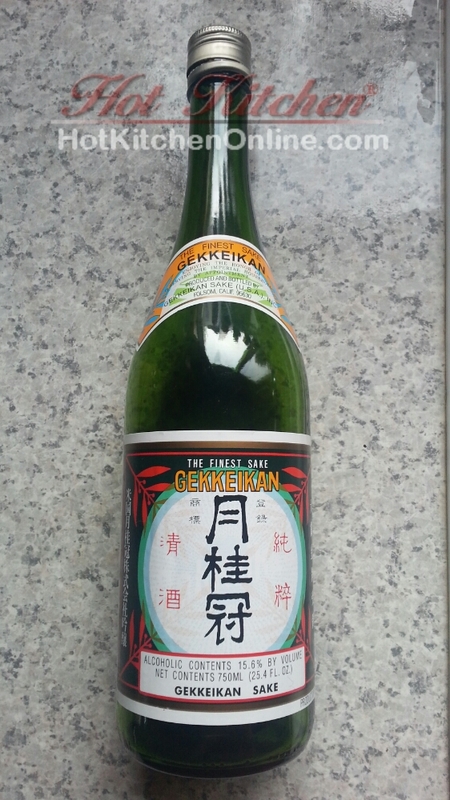 As far as sake goes, this one will never land in my shopping basket again. It tasted like airplane fuel and bitters were brewed together. Don’t buy this miso soup brand unless you love the flavor of spoiled seafood! Okay, I know that’s not my prettiest presentation, but sometimes I just want to eat! Also, I realized my cupboards contained no suitably-sized black dish for the photo op. Then we made ourselves a few rounds of nori and rolls. Before we knew it, the sake was gone and we were full. So after gorging ourselves, a healthy amount of dressed rice, sliced fish and radish sprouts remained. Hooray! We shall feast sushi two days in a row. We spent $40 on fish, rice vinegar, nori, sake, veggies, and tempura shrimp. Pretty obvious where you get the most mileage from your dollars, right? Now the sake: um, yeah, lets talk about it. I hated it. At the back end of the taste was this harsh, airplane fuel-like essence, followed by an unpleasant bitterness. When warm, the bitterness was cutting. When cool, the essence ‘d airplane was overwhelming. Like good boys and girls, we choked it down, but that brand has now made it to my “never again” list.